Earlier this year, I got asked to work on a collaboration with Love Knitting and Battersea Cats and Dogs home, and here is the result: the Ray the Cat square. 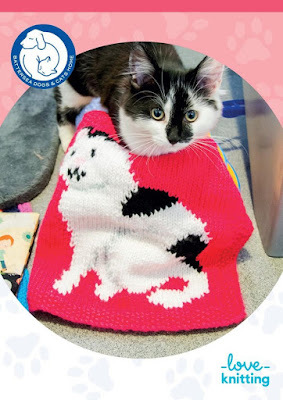 The Ray the Cat square is a collaboration between Vikki Bird Designs, Love Knitting and Battersea Dogs and Cats home. Battersea Dogs and Cats Home is an animal chalter that rescues animals in need and looks after them until they can be rehomed. Every cat at Battersea is given their own blanket to snuggle in, and when the cat is rehomed, the blanket is sent home with the cat as a comforter. The cat featured on the square, Ray, is a cat who found a new home through the charity. The square is knitted in a single piece with a moss stitch border, and Ray is incorported using the intarsia technique. The square can be expanded into a blanket by knitting several squares featuring Ray, or one Ray the Cat square and several plain squares. Alternatively you could knit a single square and use it as a wall hanging or make it into a cushion cover. If you don't have anyone to knit the square for, or fancy doing some charity knitting, Battersea are always taking donations so anyone can make the Ray Square into a blanket and donate directly! 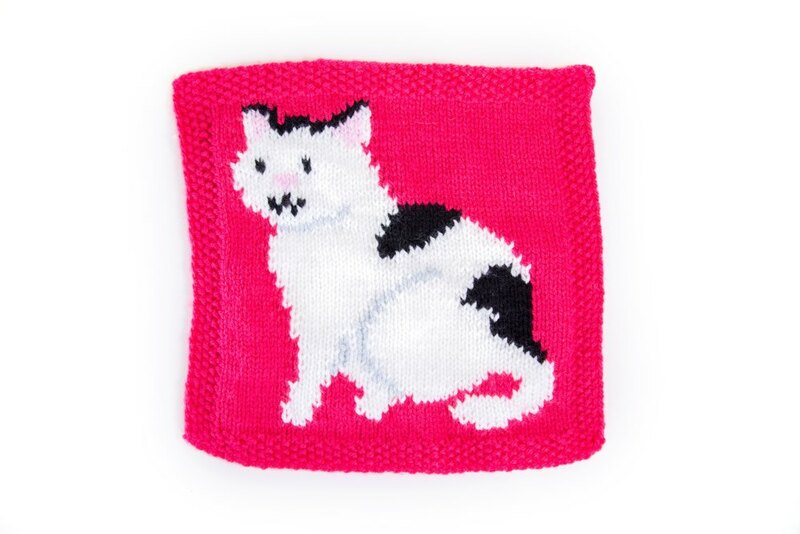 The Ray the Cat square is knitted in Paintbox Yarns Simply Aran, which is a 100% acryllic yarn, for easy care. 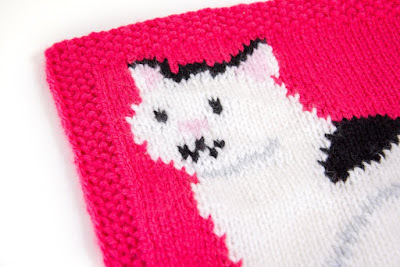 The yarn comes in 60 colours, so you could change the markings to make your square match your favourite feline. Ray the Cat isn't the only pattern produced for the project: Love Knitting have created eleven dog and cat patterns (six crochet and five knitting), each based on a real dog or cat that was once at Battersea, and has now been re-homed to a loving family. All the patterns can be found here, and 100% of the pattern proceeds go directly to Battersea Dogs & Cats Home to help find homes for even more lovely little pets. Each of the patterns has an associated colour pack, making is extra easy to pick up everything you need in one go. The kit for Ray the Cat includes full 100g balls of each of the colours you'll need, so you'll be able to knit two squares from each kit, or you could pick up an extra ball of the background colour and knit four squares. The patterns are available here, and can be purchased until the end of November. 100% of the pattern sales will go to the charity. Want to share your Ray the Cat square on social media? Use the hashtags #stitchfurbattersea and #vikkibirddesigns I can't wait to see what you come up with! Ypu can also share your projects on Love Knitting and Ravelry by creating a project page. All photos were taken at Battersea Cats and Dogs home and copyright remains with Battersea and Love Knitting. What's in your notions pouch?